It was reported that Ballerina Amelie Segarra recently wore a pair of ballet shoes attached with knives. What a challenge. Yet she was not the first mover. A female assassin, Denai, who was assigned by Lodos Mafia, wore tight suit with the knife shoes. 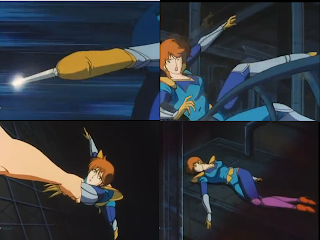 She tried to assassinate City Hunter Saeba Ryo but failed. She selected to die for failure.